During this year, construction work starts on prolonging Europe’s northernmost high-speed railway from Umeå to Dåva. More important, the Swedish government on Friday announced 5,2 billion kronor (€505 million) for building the same railway all north to Skellefteå, SVT reports. Including the 1,68 billion kroner costs for the leg Umeå-Dåva, the budget grant to North Bothnia Line is now 7 billion kronor (€680 million). After completing the first leg, construction work towards Skellefteå should start soon and at least no later than 2024, the Government says. The long term plan is to build the coastal high-speed railway all north to Luleå, the regional capital of Norrbotten. The distance Umeå to Luleå is 270 kilometres and has an estimated total coast of 23 billion kronor. Travel time would then be 90 minutes, compared with more than four hours by bus today, enabling for better commuting between the cities along the coast for workers. The new railway will, according to the Transport Administration, cut costs for freight transport by about 30%. Skellefteå is expecting a business boom as construction soon starts for the €4 billion Europe’s largets factory for electric car batteries. When completed, the railway will be connected to the already excising lines from Boden to Haparanda and the line via Kiruna to Norway’s port-town of Narvik. 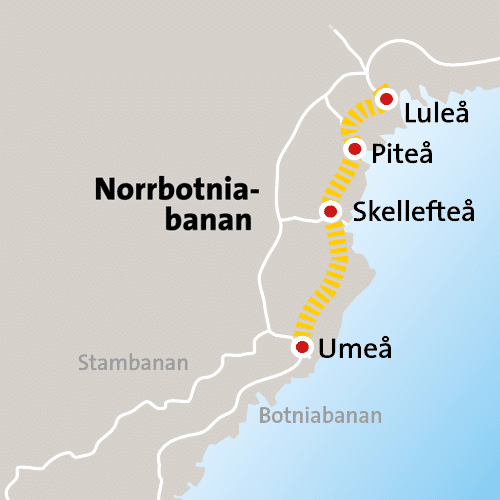 North Botnia Line is a prolongation of the Bothnia Line that opened seven years ago between Örnsköldsvik and Umeå. Last year, the European Union granted 100 million Swedish kroner for extending the railroad from Umeå to Skellefteå and with the positive go-ahead from the Transport Administration, cash is expected to come on the table from the Swedish Government as well.